I was reminded of this question during a recent project; our company engaged in a consulting initiative with the objective of improving the prior authorization process for complex drug products. The goal was to expedite the prior authorization process, as well as the evaluation of the clinical information gathered. The project involved decision trees, use of objective information, and focusing on “what is relevant” to making an appropriate, clinical decision on the use of these medications. When counseling patients on a new prescription medication, there is often a myriad of information about the drug to discuss with patients or their caregivers. The medication information leaflet or med-guide—if required—provides details that the patient needs to know in a printed format, and is most often reviewed after the patient has left the pharmacy. In the short amount of time we have to council the patient, how do we decide which areas to focus our time on and communicate to the patient? Most pharmacists focus on “what is relevant” to that patient based upon their disease state or other health conditions. What motivates a patient to take a medication with a complex dosing regimen, high cost, and/or untoward side effects? It is the desire to get better, control their numbers, or, in severe, life-threatening situations, to make it to a milestone life event. 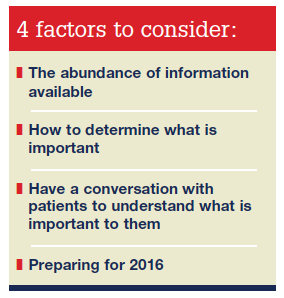 When interacting with our patients, it is essential to find out “what is relevant” to them and their lives. At Inside Patient Care, we have a variety of topics and articles to consider for inclusion in the publication. For each issue, we evaluate articles using a variety of factors, including “what is relevant” to our readers. For 2016, our goal as editors of this publication is to continue providing our readers with useful, actionable material that you can apply in your pharmacy, clinic, or professional lives. As we enter 2016, expect our professional lives to become more complicated—not less. New and more complex medications are being approved by the US Food and Drug Administration. Treatment guidelines are being updated more regularly. Quality measures are being added, and are impacting pharmacy to a greater degree. Reimbursement rates will likely become more aggressive. The regulations we face to remain compliant with federal and state laws are becoming more onerous. All of these changes impact the amount of time we have available to provide appropriate patient care. The use of technology and ancillary support personnel are certainly key steps to performing these activities. Although I cannot specifically address the challenges each of you faces in your profession and workplace, a good rule of thumb is to remember the patient, and focus on what is relevant. What unique strategies do you use to ensure that patients understand the purpose of their medication? A: I like the teach-back method. I don’t think we really know if the patient understands something until they have explained and/or demonstrated it. It is an old method but still useful for verifying that, at least while they are still on-site, the patient can actually remember the steps or activity that was taught. The piece that is often still missing is how this translates to the home environment. I believe that validating the patient’s ability to self-medicate is a significant, and growing, area of need, as our aging population contains a growing elderly patient population who take multiple medications. Failure to ensure that the patient can administer medications correctly results in return clinic visits, prolonged illnesses, worsening of chronic conditions, and hospitalizations. It is a challenge that providers have to meet creatively and in a way that is individualized to each patient’s ability and their medication regimen. A: One of the most effective strategies I have seen is the “group visit.” This is a scheduled event that patients can sign up for who share a common condition and come to a session that is led by a pharmacist to discuss with other patients strategies for effective self-management. The pharmacist prepares an overview of the condition (eg, diabetes, hypertension, asthma) and a listing of the most common medications and self-care strategies. The goal is to lead the patients through an open discussion and help them ask and answer questions and also learn from others. These sessions provide a comfortable and safe social setting for patients who struggle to either ask and articulate questions, or understand the right way to manage their conditions and medication therapy.